Keeping the Pounds Off! : Changing Seasons, Changing Foods? I remember when Labor Day was the day the fashion mavens said to put away the white shoes, clothes, the summer sandals and the shorts and clam diggers/capri/crop pants. 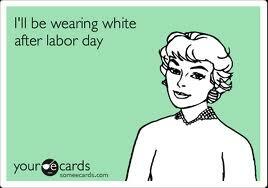 If you wore white after labor day you were committing a fashion crime. If you must wear white it was supposed to be a 'winter white,' a subdued, lovely color that lacked the bright dazzle of the crisp pure whites. Then the fashion rules changed a bit (depending on who you talk to) and people started wearing what they wanted when they wanted to wear it - although it is still unusual to see someone in the northeast wearing crisp white in November, outside a wedding ceremony. When I moved to Florida I gave up even pretending to follow the fashion rules. The sandals almost never go away here. Pants of all lengths are worn year round. Winter white is hard to find, even in December. 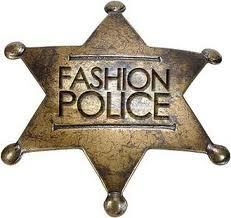 I wear what makes me feel good. I buy new clothes that make me happy. If I am not smiling from ear-to-ear when I put it on, I do not buy it. Why should I purchase or wear it if it does not please me to have it on? This is not a practice I can carry over into my food. I cannot necessarily eat what makes me happy or makes me feel good. I do not always smile at my dinner plate. My food does not have to please me in every way. Granted, I do not eat foods that make me gag however, I do choose my food in relation to what is good for me over what the sensation of eating it will do for me. I have to eat this way. I am a food addict and the changing seasons does not change who I am. I do eat more hot foods in the fall and winter and less cold dishes - but that does not change the basic makeup of my foods. In keeping the pounds off I notice that the seasons remain Winter, Spring, Summer and Fall, not Cookie, Chocolate, Ice Cream and Pie. Once upon a time, I saw every change in the weather as an opportunity to indulge in seasonal foods. Gratefully, I have learned to pause and think about what is really changing - weather - not me. I am not saying I never ever eat a cookie or a soft-serve cup; I just cannot think of the seasons in terms of my food. My wardrobe can change but my pantry remains fairly consistent. How do you stay on track with your food plan when the seasons change? I enjoy what I eat. But I do not eat everything I enjoy. I would never say to a 2-4 year old - do you need to go potty? Instead I would say - do you want to go in the upstairs potty or the downstairs potty? (in other words, you are going potty). Same way - I do not say to myself - what in the whole wide world do you want to eat? Instead I say to myself - do you want green beans, broccoli, asparagus, brussel sprouts or all four? Do you want them hot or cold? Do you want to eat them on the nice blue plate or in a glass bowl? Do you want to eat them with your fork or fingers? (I am very fond of fingers). My pantry will once again include oatmeal when it gets cooler and it sounds good once more. My fridge has different fruits and veggies depending on the seasons and the prices. I'm pretty happy eating the same things day in and day out but I also do include a treat here and there especially during the holidays. Cranberry pie comes to mind. It is a Christmas Eve tradition that I do not turn down.